Do not miss another Crocs voucher! Simply leave your e-mail address and we'll always keep you informed of new vouchers for Crocs. Affiliate Exclusive! 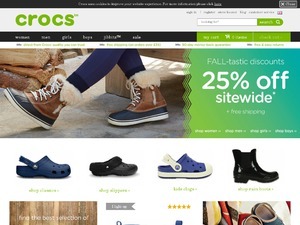 Take 15% discount on with Purchase of 2 or More Sale Styles with Code 15OFF at Crocs.com! Offer Valid Until 12/31! Offer condition: Excluding Jibbitz and outlet items. Affiliate Exclusive! 46% discount on Walu with Code WALU46 at Crocs.com! Offer valid 4/9-4/30! Affiliate Exclusive! 40% discount on Women's Leigh Wedge with Code LEIGHWEDGE40 at Crocs.com! Offer Valid 4/9-4/30! Affiliate Exclusive! 40% discount on Bayaband Clogs with Code BAYABAND40 at Crocs.com! Offer Valid 4/1-4/30! Affiliate Exclusive! 43% discount on Kids Bayaband Clogs with Code KIDSBAYABAND43 at Crocs.com! Offer Valid 4/1-4/30! Affiliate Exclusive! Take 40% discount on the Classic Sandal with code CLASSICSANDAL40 at Crocs.com! Offer Valid 3/11-3/31! Latest voucher code valid at a time of promo publication was entered to be working from 2018-04-09.